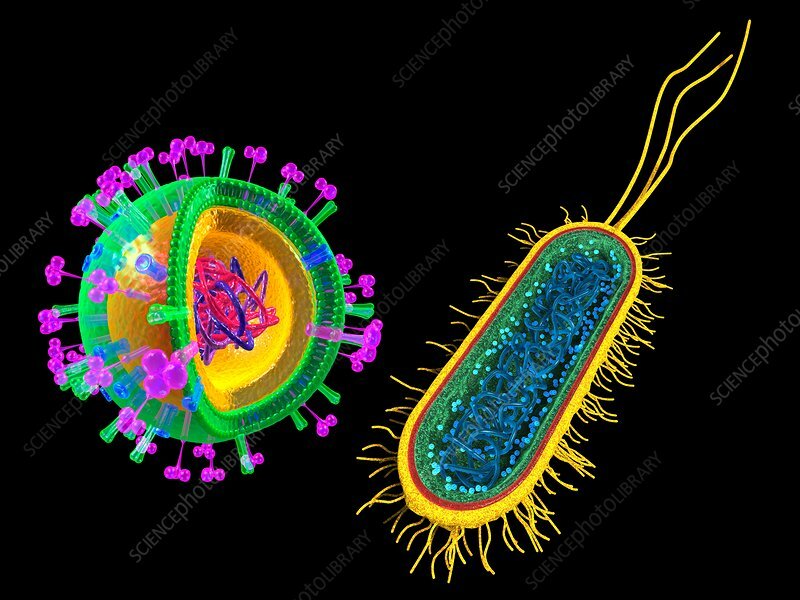 Illustration of an influenza virus (left) and an Escherichia coli bacterium (right). The core of the virus is its genetic material, strands of single-stranded RNA (ribonucleic acid). Surrounding these is a capsid protein coat (yellow) lipid envelope (green). Embedded in the envelope are three types of surface protein: haemagglutinin (H, green), neuraminidase (N, purple), and M2 ion channels (blue). The E. coli cell contains DNA (deoxyribonucleic acid, blue strands), the genetic material, and ribosomes (blue dots), the site of protein synthesis. It is surrounded by a plasma membrane (green), cell wall (red) and capsule (yellow). Within the capsule are pili (short yellow strands), which are used to adhere to surfaces, and flagella (long yellow strands), which are used for locomotion.